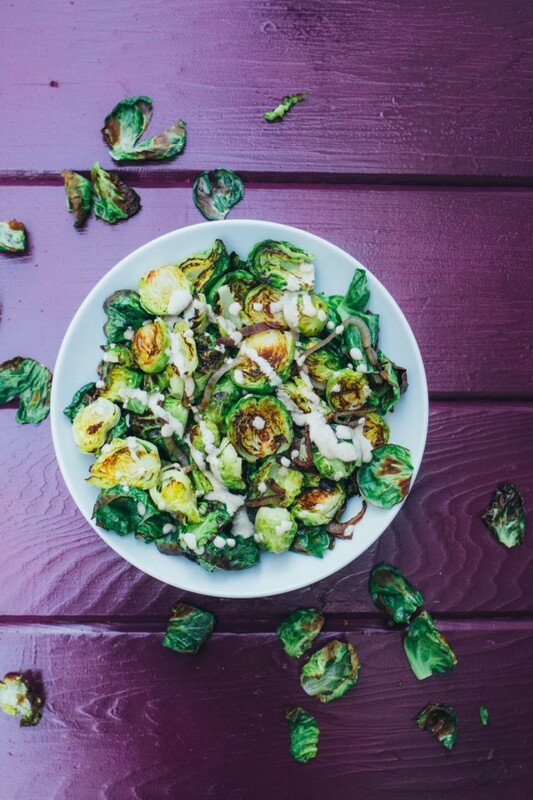 Anyone who doesn’t like Brussels sprouts– is CRAZY in my book. They are freaking delicious! I can honestly eat the entire batch of these all by myself. But, since I am trying to teach our oldest daughter to share…. I guess I should set a good example. In all honesty, it is difficult to mess up a batch of roasted Brussels Sprouts and they are one of my favorite side dishes to make. I believe I have perfected the preparation of Brussels, not to brag but I have had lots of practice! 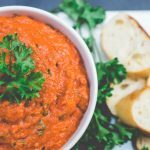 Here are a few tips I think will make them a more approachable veggie. It is super important to CLEAN your Brussels! Especially when you buy organic, you never know what can be hiding under all those layers. I usually fill up one side of my sink and let them hang out in some warm water while I get together the rest of my ingredients. I also like to throw in leftover “leaves” once the cleaning and cutting process is complete. Why waste all that goodness?! Cut them in varied ways. I dice mine in a few different ways. Some in half, some 3 or 4 times, some length wise, and at the end I throw in some of the leaves that fell off during the process. 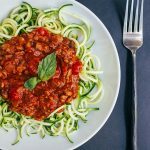 This way there is a variety of consistency and it makes for an overall pretty dish. Evenly distribute oil. I place all pieces in a zip lock baggie (see photo below) and drizzle a teaspoon or two (depending on how large the batch) of coconut oil and shake. This way you can avoid over oiling your veggies and the oil gets on all sides equally. Don’t overcook! Aint nobody got time for a soggy Brussels Sprout! Roast on both sides until you see a slight “goldening” start to happen, but can still see that gorgeous green! 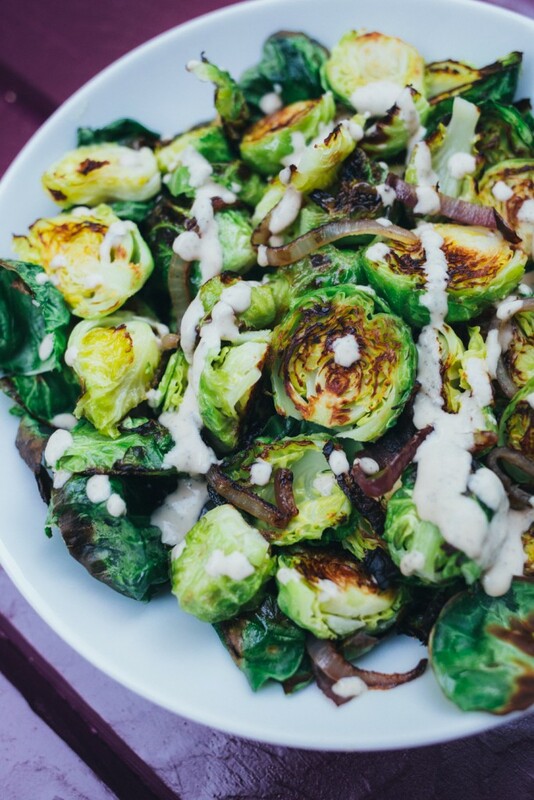 The combo of the roasted Brussels Sprouts (and caramelized red onion) with my Tahini Ranch is out of this world. You hit the entire spectrum of flavor– earthy, salty, tangy, crispy, lightly sweet and creamy. 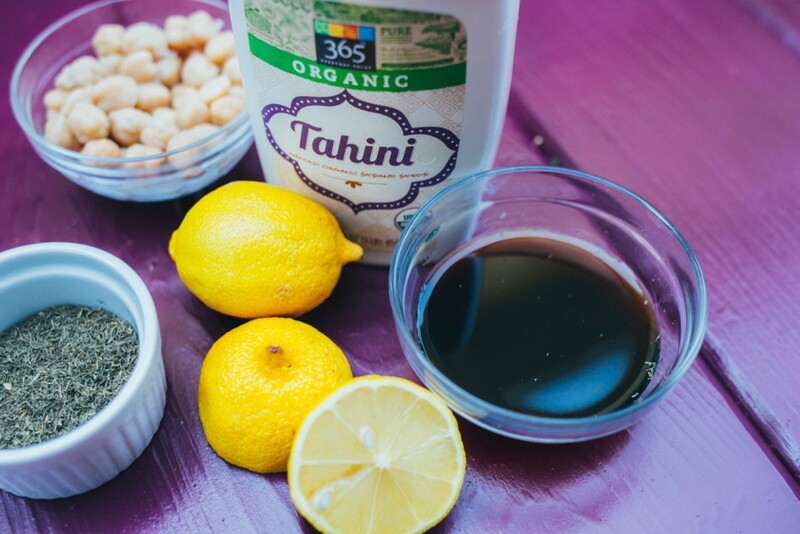 The tahini ranch is simple to make and can be stored in the fridge for about 5 days to be used on many other dishes. 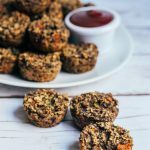 Baked potatoes, burritos, tofu stir fry, tempeh wings… tempeh salad…. chickpea salad… the list goes on. Soak Brussels Sprouts in warm water for about 5 minutes, then clean them and remove any loose leaves. Slice half the Brussels in half, and the other half twice length wise. 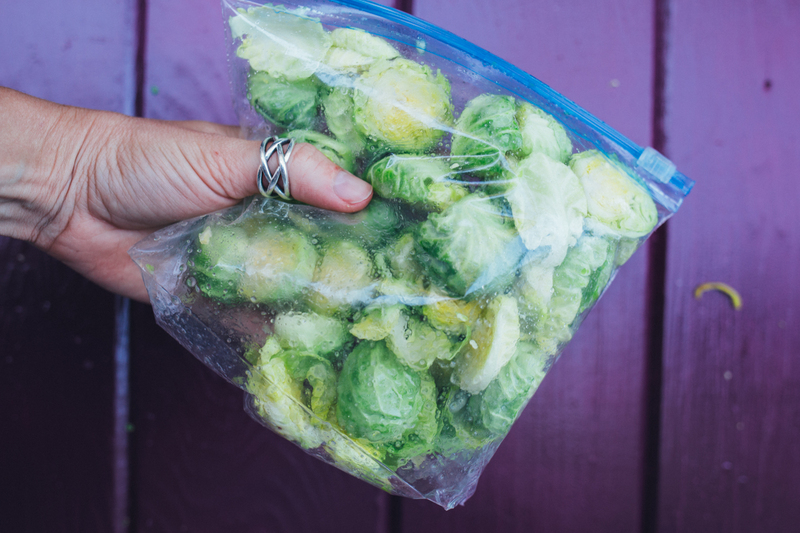 Toss all Brussels pieces into a ziplock baggie and drizzle with the melted coconut oil. Shake well. 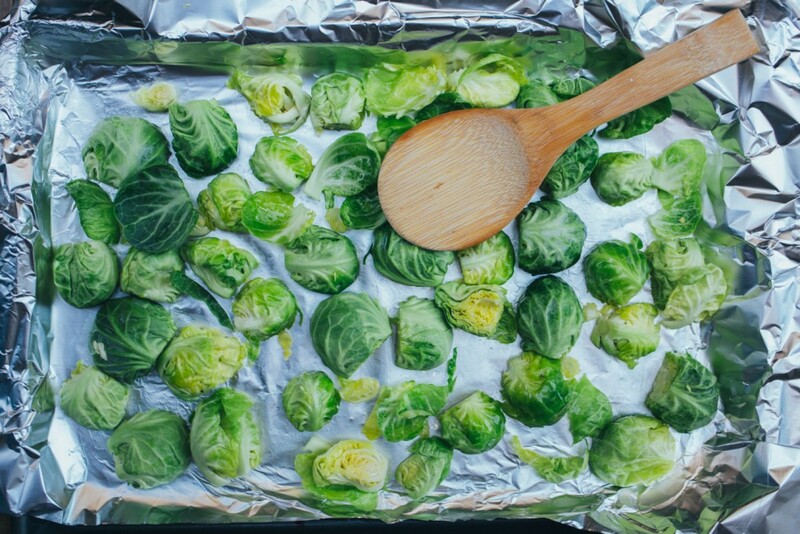 Place oiled Brussels onto cookie sheet and roast in oven for 10 minutes, remove from oven and rotate Brussels and roast on other side for 8-10 minutes. They should be slightly browned, but mostly green! Keep your eye on them, so they do not burn. Slice red onion into thin long pieces and slowly brown on skillet, set to medium/low heat, with a teaspoon of coconut oil. This process should take about 10-20 minutes. Depending on the density of your Brussels or how thinly you slice them. Keep an eye out and adjust cooking time as needed. 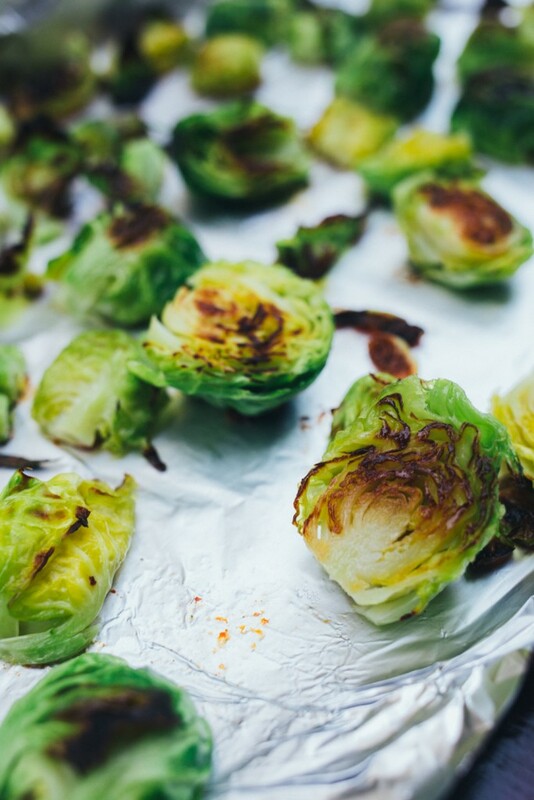 Toss roasted Brussels Sprouts with caramelized onion and set aside. 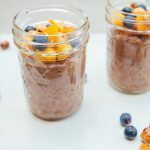 Take tahini, fresh lemon juice, garbanzo beans, liquid aminos, dill and water into high powered blender and blend on high until mixture is smooth and creamy. 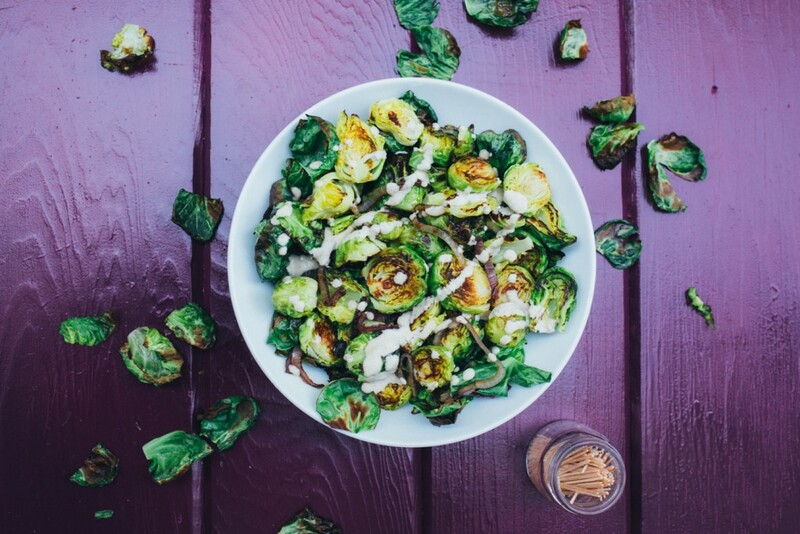 Drizzle tahini ranch over Brussels Sprouts and top with cracked black pepper. 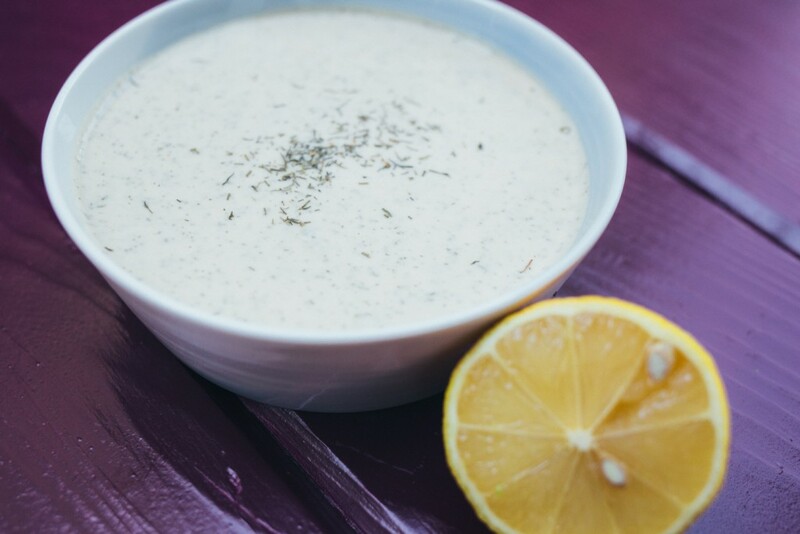 You will have a good amount of Tahini Ranch left over. You can keep it in an air-tight container in the fridge for up to 5 days and use it on potatoes, salads or roasted veggies.